SAT scores are weird. You get a number, ending in a zero, on a scale of 200 to 800, twice: one for reading & writing, one for math. You get a total score between 400 and 1600...except, of course, for those years when the writing was separate and you got somewhere between 600 and 2400. You're allowed to take the test multiple times and combine your highest reading & writing score with your highest math score, giving you a "superscore" that's higher than the total scores you got any of the individual times you took the test. And then what? What does that number even mean? What do your SAT scores say about you? Nobody really knows what they mean. Try it. Ask 10 people "Is 1250 a good SAT score?" and see the range of responses you get. You can compare your scores to other people's scores, either individuals or groups. People do this all the time when they look for average SAT scores (or mid-ranges) for certain schools. But is that useful? How do colleges use the scores? There's no narrative attached to your score, no indicator of significance. AP scores, however, are nice and neat. There are only five scores you can get: 1, 2, 3, 4, or 5. There's only one score, a composite of the different sections. What's really great about AP scores, though, is that we know exactly what they mean. There's a descriptor to go along with it. 1 means they don't recommend you should get anything for that test. 2 means you "may be qualified" to say you learned the material. It doesn't mean you aren't qualified, and you showed some promise. But the test that day didn't go well. 3 means "qualified," 4 means "well qualified," and 5 means "extremely well qualified." So if someone tells me they got a 4 on their AP Physics exam, then I know that they are well qualified to take and pass a college introductory course in physics. Not guaranteed, but well qualified. Each individual college can do whatever they want with that score: they may give the student college credit, they may let the student skip introductory Physics and go on to an upper-level class, they may do nothing. But we all know what the score means, and comparing scores is pretty simple and reliable. That's what SAT scores should look like. Students should get a score from one to five, and the score should correspond to an actual assessment of their readiness for college work. 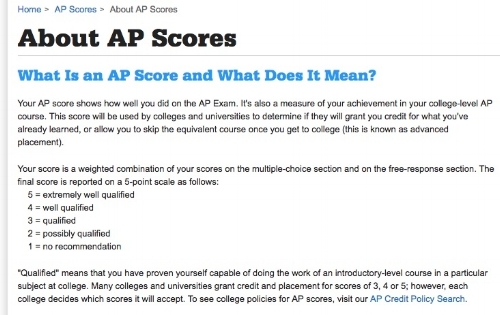 As with AP scores, universities should be able to do what they choose with scores, but the statistics on their brochures and website would be easy to read. For example, instead of a box with the mid-range scores for last year's class, it could say in a narrative form "78% of our incoming first-year students were rated as well qualified or extremely well qualified on their SAT." A new, simplified scoring system could be really good for the College Board, who administers both the SAT and AP exams. For one, it might help the test regain some of the relevance it's lost over the years. The list of test-optional colleges grows every year, and there's a sense that maybe the test just isn't so useful. A simplified scoring system may not reverse the trend of colleges making it optional, but the SAT could get a boost in relevance if people could quickly and intuitively know what the scores mean. An AP-like score for the SAT might also help them keep up with their main competitor, the ACT. The ACT already uses a simple composite score between 1 and 36, though without any descriptor. Simplified scores could make life easier for colleges, too. Schools may be moving toward test-optional, but it's going to be a long time before they can completely move away from 3rd-party, (supposedly) objective ways to measure the quality of their graduates and the quality of their applicants. Everyone knows many universities need faster, more efficient ways to look through applications and compare candidates, and having five clear categories instead of a range of dozens of different scores would make things easier without sacrificing quality. Frankly, it could make it less contentious to decide whether to hold onto a candidate or let them go. It's a lot easier to say "we need at least 30% of our acceptances to be 5s on the SAT" than it is to say "we need to find ways to raise our median score from 1320 to 1370 while still being open to some 1080s." It would also let schools more clearly broadcast their expectations and flaunt their successes if scores are easy to explain. What's in it for you? What advantage would a five-score system have for students? You'd still need to prepare for the test, and--depending on the colleges you apply to--the score could still be a pretty big factor in your applications. So what does it matter? I think most the difference would be psychological. Imagine getting your SAT scores, and knowing immediately if you're happy with them or not. Lots of high school students get scores and then ask themselves "Is that a good score?" And then they take them home, where their family asks "Is that a good score?" And the best answer any of them can get is "maybe. It depends on a lot of things." That's frustrating. But getting a score and immediately seeing "may be qualified" tells you that you need to make some changes and retake it. Getting a score and immediately seeing "well qualified" tells you that you're as good as you think you are. Even if the number is lower than you want it to be, knowing immediately what the number means takes away some of the anxiety and more quickly leads to action, whether it's to re-take the test, be satisfied, or be very satisfied. My hunch is that AP-like scores would cut way down on re-testing, too. No one, or at least almost no one, would be tempted to re-take the exam hoping for a tiny marginal improvement. I've seen too many students take multiple SATs trying to get past some arbitrary number, usually a round number. There's no real difference between a 1390 and 1400, but people think that round number looks so much better that they're willing to waste their time with re-takes. When you think about how short the shelf-life of SAT scores are--they're meaningless once you begin college--then a system that discourages this could be a really good thing. Let's put it this way: In 17 years in the classroom, I taught SAT takers every year. I often saw people happy with their scores. I also saw people confused about their scores, and many took the test more than once. Between English Language, English Lit., and Art History, I taught 19 batches of AP test-taking students. Nobody ever asked me what a good score is or if they were able to re-take the test. In fact, AP scores have the opposite problem. Even though there's no such thing as "passing" and AP exam, and even though many universities don't give any reward for AP scores below 4 or even 5, there's still a common perception that 3 is a "passing" score. The scoring system is so simple that people may have internalized it too well. I wish things were the same with the SAT. So to summarize: making SAT scores more like AP scores can be good for the College Board, for colleges, and for students. There's already a great precedent for how those scores would look and how they'll be interpreted and used, because AP scores have been around since the 1950s and widespread since the '70s. Through their benchmarking research, the College Board already has a pretty good idea of how to shift SAT scores from the old model to a newer, intuitive one. So come on, College Board, change the scores! Thanks for reading! For the summer, I'll only be posting once a week. There are lots of ways to get regular updates from Apply with Sanity: like me on Facebook and Twitter, get the monthly newsletter, or connect on LinkedIn. Comments are welcomed. College Board, AP, and SAT are trademarks owned by The College Board, which is not affiliated with, and does not endorse, this site. Apply with Sanity is a trademark owned by Apply with Sanity, LLC. It is associated with this site, and endorses it completely.